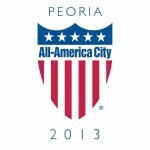 We're so proud of Peoria, we put it in our name! Independent, locally owned, community bank. Warm, friendly, casual, full-service banking atmosphere in our antique office.